We are often asked to provide security guard dogs service to companies sites in the London area and have a team of security guards dogs who guard building sites, warehouses, in the London area, but we also offer a nationwide service. Security guards and dogs differ from usualy corporate security guard services, mainly in conditions and threats, our manned guarding security service understands the demands of security service and provide security guards that are trained to identify weakness in existing security and recommend measures to strengthen them to reduce crime and be the ultimate deterrent. United have there own team of security guard dogs handlers, we are able to provide security guard dogs service for any application. Security guard dogs can be much more effective than security guards especially in low light conditions and in open spaces, they are truly a formidable team against most threats where manned security guarding is not sufficient. 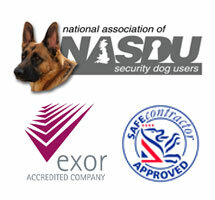 Our team of security guards guards dogs operate in the London and surrounding areas.